Eiji is an effeminate- looking man with a very small build resembling that of a young teenager or someone that was just entering their teen years. However, for his small build it comes with a lot of muscle tone and great muscle tone. His physical stature resembles that of a young fourteen or fifteen year old male. Not really impressive or frightening but he tries to make up for his less frightening appearance by showing his dominance and power through his actions and trying never to let his words carry no weight when his name is spoken among the other fraction members and leaders and to work his way to have a reputation with even the espada for being someone of worth and not just another body for disposal. In addition, he only stands at four feet and eight inches and only weighing in at ninety pounds. He is usually seen wearing black baggy pants, black and orange jacket that is accompanied by no shoes for he truly feels he doesn’t need them and loves the feeling of the hot pavement, sand, or cold stone on his feet. So his look doesn’t really scream that of fear minus the white straps with hooks at the ends of them with silver covering that usually are around his legs to make the pants look to have a white base. Though in battle he uses them to bind or even attack is enemies in close combat. 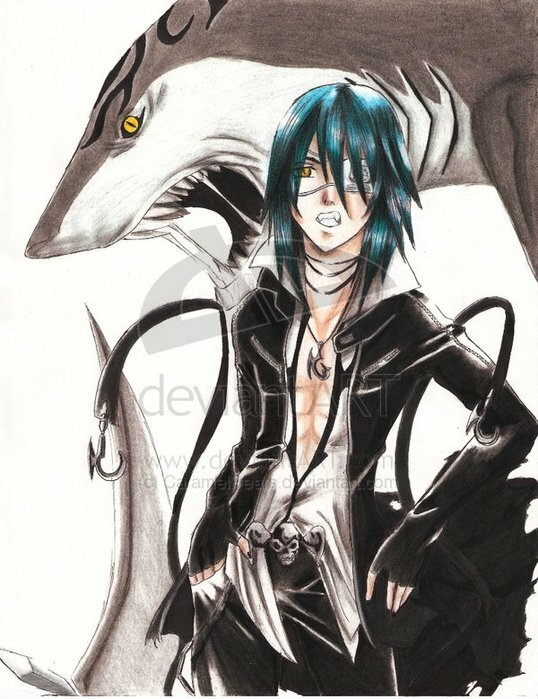 Furthermore, he is well known for his over cross twinkle eyes, dark blue spiky hair, and sharp fanged teeth that seem to resemble that of a growing shark looking for its next victim. However, for now that is all about his appearance and is the only thing that can be said other than that his hollow hole is over his broken heart and his mask fragment is over his right eye and forms something that looks like an eye patch so for his appearance that is truly all that is to be said. Eiji has a very difficult personality to get around seeing as he has a rather dark side even though he has the looks of a teenager he has lived in los noches long enough to develop a rather dark and evil persona from his death by the hands of the man he sought out to kill. Though that is in his past for that is what caused him to become the arrancar that he is now and now he lives to serve his army and allies to the best of his ability while having his own sick twisted type of fun to keep himself entertained while he waits for the moment something interesting comes into play. Though he would never target his higher ups for he knows the danger that comes with going against those strong than you from his youth in the living world. He is ruthless, sadistic, and disdainful all for good reasons that have happened into his past to form the man, being, or soulless monster you wish/choice to call him though he truly doesn’t care what one may call him as long as he can have fun. In addition, he also has quite the sadistic streak for after reaching a certain power level in his life time he felt it was no longer needed to obtain an ultamite power and take down anyone in his way but rather now he would leave them just simply close to death or mutilated so that they would forever know his name and possible one day come back again to slay him and if that day would come he would show them the true nature of his being and wouldn’t have as much mercy the second time around ad would finish them with some of the most tortures methods simply playing the battle out until his perfect set up would happen and then he would execute yourself execution. Furthermore, he is disdainful to all those other than his espada higher ups and their power for truly he feels they are like his brothers and sisters giving him a place to live, train, and people that understand or at least pretend to and put up with his sometimes distasteful acts that would only further cause problems for recruiting more people to the organization. However, he wasn’t always like this it was only after the first few years he lingered in his death after the fateful event would transpire that he would learn to not always respect everyone but truly disrespect everyone until they would give him a reason to show any form or respect or restrain to his actions and he feels the people he is under now have shown him those reasons. Along with all of this he can be a rather nice and mellow person even though rare it is for anyone to see this for he would have to really enjoy your company and would have to have a deep level of trust and respect to you to show you his soft side for no one can truly be hard or evil all of the time there are the every few people they do care about and some people would do anything to find out who those are so he chooses who he shows this side to carefully an refuses to show it without a deep understanding of the person as well. So it is very rare even among the espada to know who he cares about and who he would kill to obtain a higher rank though he likes it that way so that he doesn’t go soft nor does the people he holds to such a high standard of actions and behavior. Eiji was born into the world on a cool autumn morning at 9:45 on September 22, this would mark the day of a rising star but also the day that it would fall before ever truly reaching its full heights and would go crashing to the grounds many layers of darkness until he finally couldn’t even begin to see the same person that he was at the start of this tragic yet maybe fruitful events. He would live his first few years as any other young child would running around with his mother and father playing catch with his father and learning to ride a bike while he would run to his mother when he fell onto the ground and scrapped his knee in the even slightest way… Though this wonderful existence and blissful façade would come to a swift and tragic end once the rifts in the relationship between his mother and father would come into plain site, he would notice at the age of ten that his mother and father would start to argue over some of the most small details in life like who would take him to school and which one would pick him up from his after school activities. This slight argument would always escalate to a point where his mother would yell for the child to go into his room and he would cover his ears and still hear the muffled voices of his beloved parents argue and yell. Unfortunately, one day he would be going through this routine action of going to his room and covering his ears as he did when he was a only twelve year old boy when he would hear the first thing that would start to shatter his heart and that would be the sound of a glass or perhaps a vas hitting the wall and the pieces hitting all over the floor all he would know was that he was frightened and he never truly learned what was thrown that day but what he did know was it had made contact with his mother for the very next day that morning she would come in to kiss him for she had to leave early for the office or at least that was what she said but she had a bag with her that da and even though he was barely wake he would know what he saw and felt… the lump from where the object hit her in the head was very real and he would have a tear run slowly down her face as it would happen and this is when the star would slowly start to fall into the pits of darkness that engulfed the world and what he would soon find out later all the people that inhabited it. Though this wouldn’t even begin to be the worst part of his life thought it would be the part to send him into the biggest spiral and would leave the greatest crack in his beginning that would result in a slow put surely acceptance and submission to his father’s statements that would soon follow his mother’s leaving. His father would soon start drinking day in and day out never letting the bottle sit down for too long only to throw the glass bottles at the child and run him to his rum if he would attempt to dodge them. He would receive two years of pure abuse before what he would think was his salvation would come when one day his father would finally hit his target like he did his mother however, seeing as his small stature and build was not as strong as his fully developed mother he would die on the spot when finally on his fifteenth birthday his father’s bottle of whiskey would finally hit its mark straight on the temple of the young boy however, he would have a strange sense of happiness that would flood over him as he would slowly fade into the darkness that would be death and it would mark the last moment he would even open his eyes. In addition, to him actually figuring out his life would get worse in the afterlife but realizing his hatred for his father he wouldn’t be able to pass on after death but he would watch over his father and notice that after his death he went back to the man he used to be and would blame the death of his son on a freak accident when they were playing in the yard… this would send the boy into a violent and uncontrollable temper turning him into the shark hollow that he would first become however, he wouldn’t target anyone else in this blind rage for after going into his rage hollow form he would soon kill his father eating his soul mere moments after his awakening and this would send his heart into a decay and would form his hollow hole right over his heart for that truly was the part of his body and soul that was damaged the most in his life and the action when he first hit the afterlife. Furthermore, after that he would go into a very familiar darkness however, this time when the boy would awake he would be in a strange land and wouldn’t know at all where it was and this would be the place he would later learn to be known as White Sand Desert. This would be where he would arrive and survive his first many centuries as a hollow. Slowly gathering enough souls and killing enough other hollows to evolve into something more…. Something much stronger than his previous form and with this change he would also develop his new personality from a fragile young boy into the vicious demon many people would know to this day. Though Eiji’s uprising to being the fraccion leader for the Tercera espada that many hollows and arrancar know today he would face many difficulties for he had such a fragile and weak nature through the process of becoming who/what he is today that even little step was harder than many think it should have been yet now to get to his final goal might be one of the easiest things he will ever do for he feels he finally understands the world and what it is to be “strong” and “useful” but truly he would simply be scratching the surface of what it meant to be one of those things let alone both of them. In addition, he would begin to have an unbelievable bloodlust for he truly was starting to enjoy the feel of the blood and feel of flesh in his mouth as he would start to devour more and more hollows like an actual shark his teeth would be sharp and his instincts and natural intelligence would be coming back and becoming sharper over time. He would be a master hunter by the time he would be found by one of the what would now be lost espada the Tercera espada one that was not found at the end of the war. However, he wouldn’t know that at the time and would near die because of it and before he struck the final blow he would ask for his life if he served under him to always watch his back… so when the time of the war came he would be his lead man finding his way into the seireitei as for his special ability was one of the key things that help them get into the inner parts on seireitei and thanks to his ability to open the garganta it started the surprise attack that would allow the later espada to come and do the major damage to it and find its way in as many of the soldier would be focused on the random and un seen invasion. So with that was the final thing he needed to stay and later he would find himself being the lead fraccion for one of the men that would have spared him before. This was the moment that he realized he finally had captured his prize in life or should he say after life for dealing with the unbearable simpleton that he knew to be his father.